Idi Amin Dada Oumee (/ˈiːdi ɑːˈmiːn/; (17 May 1925 – 16 August 2003) was a Ugandan politician and military officer. He served as the President of Uganda from 1971 to 1979. During his years in power, Amin shifted from being a pro-western ruler enjoying considerable support from Israel to being backed by Libya's Muammar Gaddafi, Zaire's Mobutu Sese Seko, the Soviet Union, and East Germany. In 1975, Amin became the chairman of the Organisation of African Unity (OAU), a Pan-Africanist group designed to promote solidarity among African states. Uganda was a member of the United Nations Commission on Human Rights from 1977 to 1979. The UK broke diplomatic relations with Uganda in 1977, and Amin declared that he had defeated the British and added "CBE" to his title for "Conqueror of the British Empire". Radio Uganda then announced his entire title: "His Excellency President for Life, Field Marshal Alhaji Dr. Idi Amin Dada, VC, DSO, MC, CBE". Amin did not write an autobiography, and he did not authorize an official written account of his life. There are discrepancies regarding when and where he was born. Most biographical sources claim that he was born in either Koboko or Kampala around 1925. [a] Other unconfirmed sources state Amin's year of birth from as early as 1923 to as late as 1928. Amin's son Hussein has stated that his father was born in Kampala in 1928. According to Fred Guweddeko, a researcher at Makerere University, Amin was the son of Andreas Nyabire (1889–1976). Nyabire, a member of the Kakwa ethnic group, converted from Roman Catholicism to Islam in 1910 and changed his name to Amin Dada. He named his first-born son after himself. Abandoned by his father at a young age, Idi Amin grew up with his mother's family in a rural farming town in north-western Uganda. Guweddeko states that Amin's mother was Assa Aatte (1904–1970), an ethnic Lugbara and a traditional herbalist who treated members of Buganda royalty, among others. Amin joined an Islamic school in Bombo in 1941. After a few years, he left school with only a fourth-grade English-language education, and did odd jobs before being recruited to the army by a British colonial army officer. Amin joined the King's African Rifles (KAR) of the British Colonial Army in 1946 as an assistant cook. In later life he falsely claimed to have served in the Burma Campaign of World War 2. He was transferred to Kenya for infantry service as a private in 1947, and served in the 21st KAR infantry battalion in Gilgil, Kenya until 1949. That year, his unit was deployed to northern Kenya to fight against Somali rebels in the Shifta War. In 1952, his brigade was deployed against the Mau Mau rebels in Kenya. He was promoted to corporal the same year, then to sergeant in 1953. In 1959, Amin was made Afande (warrant officer), the highest rank possible for a black African in the colonial British Army of that time. Amin returned to Uganda the same year and, in 1961, he was promoted to lieutenant, becoming one of the first two Ugandans to become commissioned officers. He was assigned to quell the cattle rustling between Uganda's Karamojong and Kenya's Turkana nomads. 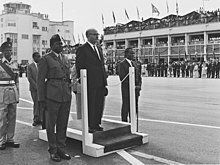 In 1962, following Uganda's independence from the United Kingdom, Amin was promoted to captain and then, in 1963, to major. He was appointed Deputy Commander of the Army in 1964 and, the following year, to Commander of the Army. In 1970, he was promoted to commander of all the armed forces. Amin was an athlete during his time in both the British and Ugandan army. At 193 cm (6 ft 4 in) tall and powerfully built, he was the Ugandan light heavyweight boxing champion from 1951 to 1960, as well as a swimmer. Amin was also a formidable rugby forward, although one officer said of him: "Idi Amin is a splendid type and a good (rugby) player, but virtually bone from the neck up, and needs things explained in words of one letter". In the 1950s, he played for Nile RFC. There is a frequently repeated urban myth that he was selected as a replacement by the East Africa rugby union team for their 1955 match against the British Lions. Amin, however, does not appear in the team photograph or on the official team list. Following conversations with a colleague in the British Army, Amin became a keen fan of Hayes Football Club – an affection that remained for the rest of his life. 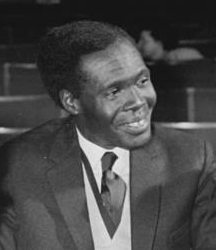 In 1965, Prime Minister Milton Obote and Amin were implicated in a deal to smuggle ivory and gold into Uganda from the Democratic Republic of the Congo. The deal, as later alleged by General Nicholas Olenga, an associate of the former Congolese leader Patrice Lumumba, was part of an arrangement to help troops opposed to the Congolese government trade ivory and gold for arms supplies secretly smuggled to them by Amin. In 1966, the Ugandan Parliament demanded an investigation. Obote imposed a new constitution abolishing the ceremonial presidency held by Kabaka (King) Mutesa II of Buganda, and declared himself executive president. He promoted Amin to colonel and army commander. Amin led an attack on the Kabaka's palace and forced Mutesa into exile to the United Kingdom, where he remained until his death in 1969. Amin began recruiting members of Kakwa, Lugbara, South Sudanese, and other ethnic groups from the West Nile area bordering South Sudan. The South Sudanese had been residents in Uganda since the early 20th century, having come from South Sudan to serve the colonial army. Many African ethnic groups in northern Uganda inhabit both Uganda and South Sudan; allegations persist that Amin's army consisted mainly of South Sudanese soldiers. Eventually a rift developed between Amin and Obote, exacerbated by the support Amin had built within the army by recruiting from the West Nile region, his involvement in operations to support the rebellion in southern Sudan and an attempt on Obote's life in 1969. In October 1970, Obote took control of the armed forces, reducing Amin from his months-old post of commander of all the armed forces to that of commander of the army. Having learned that Obote was planning to arrest him for misappropriating army funds, Amin seized power in a military coup on 25 January 1971, while Obote was attending a Commonwealth summit meeting in Singapore. Troops loyal to Amin sealed off Entebbe International Airport and took Kampala. Soldiers surrounded Obote's residence and blocked major roads. A broadcast on Radio Uganda accused Obote's government of corruption and preferential treatment of the Lango region. Cheering crowds were reported in the streets of Kampala after the radio broadcast. Amin announced that he was a soldier, not a politician, and that the military government would remain only as a caretaker regime until new elections, which would be announced when the situation was normalised. He promised to release all political prisoners. Amin held a state funeral in April 1971 for Edward Mutesa, former King (Kabaka) of Buganda and President who had died in exile; freed many political prisoners; and reiterated his promise to hold free and fair elections to return the country to democratic rule in the shortest period possible. On 2 February 1971, one week after the coup, Amin declared himself President of Uganda, Commander-in-Chief of the Armed Forces, Army Chief of Staff, and Chief of Air Staff. He announced that he was suspending certain provisions of the Ugandan constitution, and soon instituted an Advisory Defence Council composed of military officers with himself as the chairman. Amin placed military tribunals above the system of civil law, appointed soldiers to top government posts and parastatal agencies, and informed the newly inducted civilian cabinet ministers that they would be subject to military discipline. Amin renamed the presidential lodge in Kampala from Government House to "The Command Post". He disbanded the General Service Unit (GSU), an intelligence agency created by the previous government, and replaced it with the State Research Bureau (SRB). SRB headquarters at the Kampala suburb of Nakasero became the scene of torture and executions over the next few years. Other agencies used to persecute dissenters included the military police and the Public Safety Unit (PSU). Obote took refuge in Tanzania, having been offered sanctuary there by the Tanzanian President Julius Nyerere. Obote was soon joined by 20,000 Ugandan refugees fleeing Amin. The exiles attempted but failed to regain Uganda in 1972, through a poorly organised coup attempt. Amin retaliated against the attempted invasion by Ugandan exiles in 1972, by purging the army of Obote supporters, predominantly those from the Acholi and Lango ethnic groups. In July 1971, Lango and Acholi soldiers were massacred in the Jinja and Mbarara barracks. By early 1972, some 5,000 Acholi and Lango soldiers, and at least twice as many civilians, had disappeared. The victims soon came to include members of other ethnic groups, religious leaders, journalists, artists, senior bureaucrats, judges, lawyers, students and intellectuals, criminal suspects, and foreign nationals. In this atmosphere of violence, many other people were killed for criminal motives or simply at will. Bodies were often dumped into the River Nile. The killings, motivated by ethnic, political, and financial factors, continued throughout Amin's eight years in control. The exact number of people killed is unknown. The International Commission of Jurists estimated the death toll at no fewer than 80,000 and more likely around 300,000. An estimate compiled by exile organizations with the help of Amnesty International puts the number killed at 500,000. Among the most prominent people killed were Benedicto Kiwanuka, a former prime minister and chief justice; Janani Luwum, the Anglican archbishop; Joseph Mubiru, the former governor of the central bank of Uganda; Frank Kalimuzo, the vice chancellor of Makerere University; Byron Kawadwa, a prominent playwright; and two of Amin's own cabinet ministers, Erinayo Wilson Oryema and Charles Oboth Ofumbi. Amin recruited his followers from his own ethnic group, the Kakwas, along with South Sudanese. By 1977, these three groups formed 60 percent of the 22 top generals and 75 percent of the cabinet. Similarly, Muslims formed 80 percent and 87.5 percent of these groups even though they were only 5 percent of the population. This helps explain why Amin survived eight attempted coups. The army grew from 10,000 to 25,000 by 1978. Amin's army was largely a mercenary force. Half the soldiers were South Sudanese and 26 percent Congolese, with only 24 percent being Ugandan, mostly Muslim and Kakwa. In August 1972, Amin declared what he called an "economic war", a set of policies that included the expropriation of properties owned by Asians and Europeans. Uganda's 80,000 Asians were mostly from the Indian subcontinent and born in the country, their ancestors having come to Uganda in search of prosperity when India was still a British colony. Many owned businesses, including large-scale enterprises, which formed the backbone of the Ugandan economy. On 4 August 1972, Amin issued a decree ordering the expulsion of the 50,000 Asians who were British passport holders. This was later amended to include all 60,000 Asians who were not Ugandan citizens. Around 30,000 Ugandan Asians emigrated to the UK. Others went to Commonwealth countries such as Australia, South Africa, Canada, and Fiji, or to India, Kenya, Pakistan, Sweden, Tanzania, and the United States. Amin expropriated businesses and properties belonging to the Asians and the Europeans and handed them over to his supporters. The businesses were mismanaged, and industries collapsed from lack of maintenance. This proved disastrous for the already declining economy. In 1975, Emmanuel Blayo Wakhweya, Idi Amin's finance minister and longest serving cabinet member at the time, defected in London. This prominent defection helped Henry Kyemba, Amin's health minister and a former official of the first Obote regime, to defect in 1977 and resettle in the UK. Kyemba wrote and published A State of Blood, the first insider exposé of Amin's rule. Initially, Amin was supported by Western powers such as Israel, West Germany and, in particular, Great Britain. During the late 1960s, Obote's move to the left, which included his Common Man's Charter and the nationalisation of 80 British companies, had made the West worried that he would pose a threat to Western capitalist interests in Africa and make Uganda an ally of the Soviet Union. Amin, who had served with the King's African Rifles and taken part in Britain's suppression of the Mau Mau uprising prior to Ugandan independence, was known by the British as "intensely loyal to Britain". This made him an obvious choice as Obote's successor. Although some have claimed that Amin was being groomed for power as early as 1966, the plotting by the British and other Western powers began in earnest in 1969, after Obote had begun his nationalisation programme. Following the expulsion of Ugandan Asians in 1972, most of whom were of Indian descent, India severed diplomatic relations with Uganda. The same year, as part of his "economic war", Amin broke diplomatic ties with the UK and nationalised all British-owned businesses. That year, relations with Israel soured. Although Israel had previously supplied Uganda with arms, in 1972 Amin expelled Israeli military advisers and turned to Muammar Gaddafi of Libya and the Soviet Union for support. Amin became an outspoken critic of Israel. In return, Gaddafi gave financial aid to Amin. In the 1974 French-produced documentary film General Idi Amin Dada: A Self Portrait, Amin discussed his plans for war against Israel, using paratroops, bombers, and suicide squadrons. The Soviet Union became Amin's largest arms supplier. East Germany was involved in the General Service Unit and the State Research Bureau, the two agencies that were most notorious for terror. Later during the Ugandan invasion of Tanzania in 1979, East Germany attempted to remove evidence of its involvement with these agencies. In 1973, U.S. Ambassador Thomas Patrick Melady recommended that the United States reduce its presence in Uganda. Melady described Amin's regime as "racist, erratic and unpredictable, brutal, inept, bellicose, irrational, ridiculous, and militaristic". In June 1976, Amin allowed an Air France airliner from Tel Aviv to Paris hijacked by two members of the Popular Front for the Liberation of Palestine – External Operations (PFLP-EO) and two members of the German Revolutionäre Zellen to land at Entebbe Airport. The hijackers were joined there by three more. Soon after, 156 non-Jewish hostages who did not hold Israeli passports were released and flown to safety, while 83 Jews and Israeli citizens, as well as 20 others who refused to abandon them (among whom were the captain and crew of the hijacked Air France jet), continued to be held hostage. In the subsequent Israeli rescue operation, codenamed Operation Thunderbolt (popularly known as Operation Entebbe), on the night of 3–4 July 1976, a group of Israeli commandos flew in from Israel and seized control of Entebbe Airport, freeing nearly all the hostages. Three hostages died during the operation and 10 were wounded; 7 hijackers, about 45 Ugandan soldiers, and 1 Israeli soldier, Yoni Netanyahu (the commander of the unit), were killed. A fourth hostage, 75-year-old Dora Bloch, an elderly Jewish Englishwoman who had been taken to Mulago Hospital in Kampala before the rescue operation, was subsequently murdered in reprisal. The incident further soured Uganda's international relations, leading the United Kingdom to close its High Commission in Uganda. In retaliation for Kenya's assistance in the raid, Amin also ordered the killing of hundreds of Kenyans living in Uganda. Uganda under Amin embarked on a large military build-up, which raised concerns in Kenya. Early in June 1975, Kenyan officials impounded a large convoy of Soviet-made arms en route to Uganda at the port of Mombasa. Tension between Uganda and Kenya reached its climax in February 1976, when Amin announced that he would investigate the possibility that parts of southern Sudan and western and central Kenya, up to within 32 kilometres (20 mi) of Nairobi, were historically a part of colonial Uganda. The Kenyan Government responded with a stern statement that Kenya would not part with "a single inch of territory". Amin backed down after the Kenyan army deployed troops and armored personnel carriers along the Kenya–Uganda border. By 1978, the number of Amin's supporters and close associates had shrunk significantly, and he faced increasing dissent from the populace within Uganda as the economy and infrastructure collapsed as a result of the years of neglect and abuse. After the killings of Bishop Luwum and ministers Oryema and Oboth Ofumbi in 1977, several of Amin's ministers defected or fled into exile. In November 1978, after Amin's vice president, General Mustafa Adrisi, was injured in a car crash, troops loyal to him mutinied. Amin sent troops against the mutineers, some of whom had fled across the Tanzanian border. Amin accused Tanzanian President Julius Nyerere of waging war against Uganda, and ordered the invasion of Tanzanian territory, formally annexing a section of Kagera. In January 1979, Nyerere mobilised the Tanzania People's Defence Force and counterattacked, joined by several groups of Ugandan exiles who had united as the Uganda National Liberation Army (UNLA). 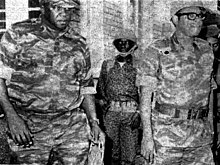 Amin's army retreated steadily, and, despite military help from Libya's Muammar Gaddafi, Amin was forced to flee into exile by helicopter on 11 April 1979, when Kampala was captured. He escaped first to Libya, where he stayed until 1980, and ultimately settled in Saudi Arabia, where the Saudi royal family allowed him sanctuary and paid him a generous subsidy in return for staying out of politics. Amin lived for a number of years on the top two floors of the Novotel Hotel on Palestine Road in Jeddah. Brian Barron, who covered the Uganda–Tanzania war for the BBC as chief Africa correspondent, together with cameraman Mohamed Amin (no relation) of Visnews in Nairobi, located Amin in 1980, and secured the first interview with him since his deposition. During interviews he gave during his exile in Saudi Arabia, Amin held that Uganda needed him, and never expressed remorse for the brutal nature of his regime. On 19 July 2003, Amin's fourth wife, Nalongo Madina, reported that he was in a coma and near death at the King Faisal Specialist Hospital and Research Centre in Jeddah, Saudi Arabia, from kidney failure. She pleaded with the Ugandan President, Yoweri Museveni, to allow him to return to Uganda for the remainder of his life. Museveni replied that Amin would have to "answer for his sins the moment he was brought back". Amin's family eventually decided to disconnect life support, and Amin consequently died at the hospital in Jeddah on 16 August 2003. He was buried in Ruwais Cemetery in Jeddah in a simple grave, without any fanfare. After Amin's death, David Owen revealed that when he was the British Foreign Secretary, he had proposed having Amin assassinated. He has defended this, arguing: "I'm not ashamed of considering it, because his regime goes down in the scale of Pol Pot as one of the worst of all African regimes". A polygamist, Idi Amin married at least six women, three of whom he divorced. He married his first and second wives, Malyamu and Kay, in 1966. In 1967, he married Nora, and then married Nalongo Madina in 1972. On 26 March 1974, he announced on Radio Uganda that he had divorced Malyamu, Nora, and Kay. Malyamu was arrested in Tororo on the Kenyan border in April 1974 and accused of attempting to smuggle a bolt of fabric into Kenya. In 1974, Kay Amin died under mysterious circumstances, with her body found dismembered. Nora fled to Zaire in 1979; her current whereabouts are unknown. In July 1975, Amin staged a £2 million wedding to 19-year-old Sarah Kyolaba, a go-go dancer with the Revolutionary Suicide Mechanised Regiment Band, nicknamed "Suicide Sarah". The wedding was held during the Organisation of African Unity (OAU) summit meeting in Kampala, and the chairman of the Palestine Liberation Organisation, Yasser Arafat served as Amin's best man. The couple had four children, and enjoyed rally race driving Amin's Citroën SM, with Sarah as navigator. Sarah was a hairdresser in Tottenham when she died in 2015. Before she met Amin, she was living with a boyfriend, Jesse Gitta; he vanished and it is not clear if he was beheaded, or detained after fleeing to Kenya. By 1993, Amin was living with the last nine of his children and one wife, Mama a Chumaru, the mother of the youngest four of his children. His last known child, daughter Iman, was born in 1992. According to The Monitor, Amin married again a few months before his death in 2003. Sources differ widely on the number of children Amin fathered, with assertions ranging from 32 to 54. [b] Until 2003, Taban Amin (born 1955), Idi Amin's eldest son, was the leader of West Nile Bank Front (WNBF), a rebel group opposed to the government of Yoweri Museveni. In 2005, he was offered amnesty by Museveni, and in 2006, he was appointed Deputy Director General of the Internal Security Organisation. Another of Amin's sons, Haji Ali Amin, ran for election as Chairman (i.e. mayor) of Njeru Town Council in 2002 but was not elected. In early 2007, the award-winning film The Last King of Scotland prompted one of his sons, Jaffar Amin (born in 1967), to speak out in his father's defence. Jaffar Amin said he was writing a book to rehabilitate his father's reputation. Jaffar is the tenth of Amin's 40 official children by seven official wives. On 3 August 2007, Amin and Sarah's son, Faisal Wangita (born in 1983), was convicted for playing a role in a murder in London. Among Amin's closest associates was the Briton Bob Astles, who is considered by many to have been a malign influence and by others as having been a moderating presence. Isaac Maliyamungu was an instrumental affiliate and one of the more feared officers in Amin's army. As the years progressed, Amin's behaviour became more erratic, unpredictable, and strident. After the United Kingdom broke off all diplomatic relations with his regime in 1977, Amin declared that he had defeated the British, and he conferred on himself the decoration of CBE (Conqueror of the British Empire). 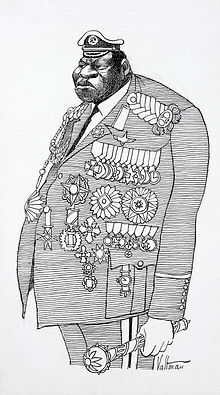 His full self-bestowed title ultimately became: "His Excellency, President for Life, Field Marshal Al Hadji Doctor Idi Amin Dada, VC, DSO, MC, Lord of All the Beasts of the Earth and Fishes of the Seas and Conqueror of the British Empire in Africa in General and Uganda in Particular", in addition to his officially stated claim of being the uncrowned King of Scotland. He never received the Distinguished Service Order (DSO) or the Military Cross (MC). He conferred a doctorate of law on himself from Makerere University as well as the Victorious Cross (VC), a medal made to emulate the British Victoria Cross. Amin became the subject of rumours and myths, including a widespread belief that he was a cannibal. Some of the rumours, such as the mutilation of one of his wives, were spread and popularised by the 1980 film Rise and Fall of Idi Amin and alluded to in the film The Last King of Scotland in 2006, a movie which earned actor Forest Whitaker an Academy Award for Best Actor for his portrayal of Amin. During Amin's time in power, popular media outside of Uganda often portrayed him as an essentially comic and eccentric figure. In a 1977 assessment typical of the time, a Time magazine article described him as a "killer and clown, big-hearted buffoon and strutting martinet". The comedy-variety series Saturday Night Live aired four Amin sketches between 1976 and 1979, including one in which he was an ill-behaved houseguest in exile, and another in which he was a spokesman against venereal disease. In a Benny Hill show transmitted in January 1977, Hill portrayed Amin sitting behind a desk that featured a placard reading "ME TARZAN, U GANDA". The foreign media were often criticised by Ugandan exiles and defectors for emphasizing Amin's self-aggrandizing eccentricities and taste for excess while downplaying or excusing his murderous behavior. Other commentators even suggested that Amin had deliberately cultivated his eccentric reputation in the foreign media as an easily parodied buffoon in order to defuse international concern over his administration of Uganda. Victory at Entebbe (1976), a TV film about Operation Entebbe. Julius Harris plays Amin. Godfrey Cambridge was originally cast as Amin, but died of a heart attack on the set. Amin commented on Cambridge's death, saying that it was "a good example of punishment by God". Comedian Richard Pryor portrayed a parodied version of Amin in his namesake show in 1977. ^ Many sources, like Encyclopædia Britannica, Encarta, and the Columbia Encyclopedia, claim that Amin was born in Koboko or Kampala c.1925, and that the exact date of his birth is unknown. Researcher Fred Guweddeko claimed that Amin was born on 17 May 1928, but that is disputed. ^ According to Henry Kyema and the African Studies Review, Idi Amin had 34 children. Some sources say Amin claimed to have fathered 32 children. A report in The Monitor says he was survived by 45 children, while another in the BBC gives the figure of 54. ^ Nakajubi, Gloria (15 July 2015). "Ugandan dictator Idi Amin's widow Sarah Kyolaba dies in the UK aged 59". The Independent. Retrieved 21 September 2015. ^ Roland Anthony Oliver, Anthony Atmore. Africa Since 1800. p. 272. ^ a b Dale C. Tatum. Who influenced whom?. p. 177. ^ a b Gareth M. Winrow. The Foreign Policy of the GDR in Africa, p. 141. ^ a b "Idi Amin: A Byword for Brutality". News24. 21 July 2003. Archived from the original on 5 June 2008. Retrieved 13 February 2012. ^ Gershowitz, Suzanne (20 March 2007). "The Last King of Scotland, Idi Amin, and the United Nations". Archived from the original on 6 June 2009. Retrieved 8 August 2009. ^ a b c d Keatley, Patrick (18 August 2003). "Obituary: Idi Amin". The Guardian. London. Retrieved 18 March 2008. ^ Ullman, Richard H. (April 1978). "Human Rights and Economic Power: The United States Versus Idi Amin". Foreign Affairs. Retrieved 24 October 2018. The most conservative estimates by informed observers hold that President Idi Amin Dada and the terror squads operating under his loose direction have killed 100,000 Ugandans in the seven years he has held power. ^ "The Rise to Power of the Butcher of Uganda". Association for Diplomatic Studies and Training. 30 August 2016. Retrieved 22 April 2019. ^ a b c d e Guweddeko, Fred (12 June 2007). "Rejected then taken in by dad; a timeline". The Monitor. Archived from the original on 12 June 2007. Retrieved 8 August 2009. ^ O'Kadameri, Billie (1 September 2003). "Separate fact from fiction in Amin stories". Originally published in The Monitor. Retrieved 8 May 2010. ^ Elliott, Chris (30 November 2014). "Idi Amin's son complains about the Guardian's obituary notice". The Guardian. Retrieved 1 December 2014. ^ a b "Idi Amin". Encyclopædia Britannica. 19 December 2008. Archived from the original on 14 March 2007. Retrieved 8 August 2009. ^ a b General Idi Amin Dada: A Self Portrait. Le Figaro Films. 1974. ISBN 0-7800-2507-5. ^ Bay, Austin (20 August 2003). "Why Didn't Amin Rot and Die in Jail?". Strategy Page. Retrieved 8 August 2009. ^ a b c "General Idi Amin overthrows Ugandan government". British Council. 2 February 1971. Archived from the original on 25 February 2007. Retrieved 8 August 2009. ^ Bridgland, Fred (16 August 2003). "Idi Amin". Scotsman. Edinburgh. Retrieved 8 August 2009. ^ Johnston, Ian (17 August 2003). "Death of a despot, buffoon and killer". Scotsmanb. Edinburgh. Retrieved 24 August 2009. ^ "The fans no team would want". Yahoo!. Eurosport. 28 May 2012. Archived from the original on 31 October 2014. Retrieved 24 November 2014. ^ "Country Studies: Uganda: Independence: The Early Years". Federal Research Division. United States Library of Congress. Retrieved 8 August 2009. ^ "Idi Amin Dada Biography". Encyclopedia of World Biography. Thomson Gale. 2005. Retrieved 20 March 2016. ^ Nantulya, Paul (2001). "Exclusion, Identity and Armed Conflict: A Historical Survey of the Politics of Confrontation in Uganda with Specific Reference to the Independence Era" (PDF). Archived from the original (PDF) on 4 October 2006. ^ "On this day: 25 January 1971: Idi Amin ousts Ugandan president". BBC. 25 January 1971. Retrieved 8 August 2009. ^ Fairhall, John (26 January 1971). "Curfew in Uganda after military coup topples Obote". The Guardian. London. Retrieved 8 August 2009. ^ Mbabaali, Jude (August 2005). "The Role of Opposition Parties in a Democracy: The Experience of the Democratic Party of Uganda" (PDF). Regional Conference on Political Parties and Democratisation in East Africa. Archived from the original (PDF) on 8 October 2011. Retrieved 8 August 2009. ^ a b c d "Country Studies: Uganda: Military Rule Under Amin". Federal Research Division. United States Library of Congress. Retrieved 8 August 2009. ^ a b "Country Studies: Uganda: Post-Independence Security Services". Federal Research Division. United States Library of Congress. Retrieved 8 August 2009. ^ a b "An Idi-otic Invasion". Time. 13 November 1978. Retrieved 8 August 2009. ^ a b Tall, Mamadou (Spring–Summer 1982). "Notes on the Civil and Political Strife in Uganda". A Journal of Opinion. Issue: A Journal of Opinion, Vol. 12, No. 1/2. 12 (1/2): 41–44. doi:10.2307/1166537. JSTOR 1166537. ^ a b Moore, Charles (17 September 2003). "Obituary: Idi Amin". Daily Telegraph. London. Archived from the original on 12 October 2007. Retrieved 31 July 2018. ^ "Disappearances and Political Killings: Human Rights Crisis of the 1990s: A Manual for Action" (PDF). Amnesty International. Archived from the original (PDF) on 28 November 2007. ^ "Special report: Who were Amin's victims?". The Daily Monitor. 13 June 2007. Archived from the original on 13 June 2007. ^ Jørgensen, Jan Jelmert (1981). Uganda: A Modern History. Taylor & Francis. pp. 288–290. ISBN 978-0-85664-643-0. ^ "Idi Amin had targeted Indians in 70s". The Times Of India. 15 April 2007. ^ a b Luganda, Patrick (29 July 2003). "Amin's Economic War Left Uganda on Crutches". New Vision. Kampala. ^ a b "On this day: 7 August 1972: Asians given 90 days to leave Uganda". BBC. 7 August 1972. Retrieved 8 August 2009. ^ a b "Flight of the Asians". Time. 11 September 1972. Retrieved 8 August 2009. ^ "Uganda Minister Named". The New York Times. 21 July 1976. Retrieved 28 November 2018. ^ A STATE OF BLOOD: The Inside Story of Idi Amin by Henry Kyemha | Kirkus Reviews. ^ "The Making of Idi Amin". New African. 1979. Retrieved 23 August 2015. ^ Baltrop, Paul (17 December 2014). A Biographical Encyclopedia of Contemporary Genocide: Portraits of Evil and Good. online: ABC-CLIO. p. 17. ISBN 978-0-313-38678-7. Retrieved 27 December 2016. ^ "240. Telegram 1 From the Embassy in Uganda to the Department of State, 2 January 1973, 0700Z". United States Department of State. Office of the Historian. E-6. 2 January 1973. Retrieved 8 August 2009. ^ "On this day: 7 July 1976: British grandmother missing in Uganda". BBC. 7 July 1976. Retrieved 8 August 2009. ^ "On this day: 4 July 1976: Israelis rescue Entebbe hostages". BBC. 4 July 1976. Retrieved 8 January 2017. ^ "'Dada' always rubbed Kenya the wrong way". Sunday Nation. 17 August 2003. Archived from the original on 6 February 2008. ^ a b "Not even an archbishop was spared". The Weekly Observer. 16 February 2006. Archived from the original on 12 October 2007. ^ Barron, Brian (16 August 2003). "The Idi Amin I knew". BBC News. Retrieved 16 September 2009. ^ "Idi Amin, ex-dictator of Uganda, dies". USA Today. Associated Press. 16 August 2003. Retrieved 24 November 2014. ^ "Idi Amin back in media spotlight". BBC. 25 July 2003. Retrieved 8 August 2009. ^ "Idi Amin, ex-dictator of Uganda, dies". USA Today. 16 August 2003. Retrieved 8 August 2009. Amin was buried in Jiddah's Ruwais cemetery after sunset prayers Saturday, said a person close to the family in the Red Sea port city. The source, who spoke on condition of anonymity, was told that very few people attended the funeral. ^ "BBC NEWS – Africa – UK considered killing Idi Amin". bbc.co.uk. Retrieved 13 September 2015. ^ a b "Reign of Terror: The life and loves of a tyrant". Daily Nation. 20 August 2003. Archived from the original on 6 February 2008. Retrieved 8 August 2009. ^ Kavuma, Richard (18 June 2007). "Special Report: Big Daddy and his women". The Monitor. Archived from the original on 18 June 2007. Retrieved 8 August 2009. ^ a b c d Kibirige, David (17 August 2003). "Idi Amin is dead". The Monitor. Archived from the original on 10 June 2007. Retrieved 8 August 2009. ^ "Kay Amin". Biography (US). A&E Networks. Retrieved 20 July 2016. ^ a b c Kalyegira, Timothy (14 June 2015). "Sarah Amin, 1954 – 2015". The Monitor (Uganda). Retrieved 20 July 2016. ^ a b Nakajubi, Gloria (15 June 2015). "Ugandan dictator Idi Amin's widow Sarah Kyolaba dies in the UK aged 59 The dictator's former "favourite" ran a hair salon in north London". Independent (Great Britain). Retrieved 20 July 2016. ^ Foden, Giles (4 August 2007). "Not quite a chip off the old block". The Guardian. London. ^ "Amins row over inheritance". BBC News. 25 August 2003. Retrieved 9 August 2009. ^ "Son of Idi Amin threatens to sue 'Last King Of Scotland' producers". Jet. 9 October 2006. p. 35. ^ Mcconnell, Tristan (12 February 2006). "Return of Idi Amin's son casts a shadow over Ugandan election". The Daily Telegraph. London. Retrieved 8 August 2009. ^ "Amin's son runs for mayor". BBC. 3 January 2002. Retrieved 8 August 2009. ^ a b "Idi Amin's son lashes out over 'Last King'". USA Today. 22 February 2007. ^ "Idi Amin's son lashes out over 'Last King'". USA Today. Associated Press. 22 February 2007. Retrieved 8 August 2009. ^ Levy, Megan (3 August 2007). "Idi Amin's son jailed for London gang attack". The Daily Telegraph. ^ "Idi Amin's son jailed over death". BBC News. 3 August 2007. Retrieved 8 August 2009. ^ Newling, Dan; Fernandez, Colin (4 August 2007). "Idi Amin's son was in gang that battered man to death in the street". Retrieved 2 February 2017. ^ "Idi Amin's Son was Leader of London Gang that Stabbed Somali Teenager to Death in Street". 4 August 2007. Retrieved 2 February 2017. ^ Kelly, Jane (19 August 2003). "Uganda's white rat". Daily News. Archived from the original on 25 January 2004. Retrieved 8 August 2009. ^ Appiah, Anthony; Henry Louis Gates (1999). Africana: The Encyclopedia of the African and African American Experience. ^ Orizio, Riccardo (21 August 2003). "Idi Amin's Exile Dream". New York Times. Retrieved 8 August 2009. ^ Serugo, Moses (28 May 2007). "Special Report: The myths surrounding Idi Amin". The Monitor. Archived from the original on 28 May 2007. ^ "Amin:The Wild Man of Africa". Time. 28 February 1977. Retrieved 8 August 2009. ^ "Benny's Place • The Faces of Benny Hill - Page 5 (1977 - 1978)". runstop.de. ^ Kibazo, Joel (13 January 2007). "A Brute, Not a Buffoon". The Guardian. London. Retrieved 8 August 2009. ... Amin was widely portrayed as a comic figure. Yes, he had expelled the Asians and murdered a few people, but isn't that what was expected of Africa, I used to hear. ^ "Idi Amin". The Telegraph. London. 18 August 2003. Throughout his disastrous reign, he encouraged the West to cultivate a dangerous ambivalence towards him. His genial grin, penchant for grandiose self-publicity, and ludicrous public statements on international affairs led to his adoption as a comic figure. He was easily parodied ... however, this fascination, verging on affection, for the grotesqueness of the individual occluded the singular plight of his nation. ^ "Amin: Actor was punished by God". St. Petersburg Times. 4 December 1976. ^ Denton, Abby (19 August 2014). "What's So Special About 'The Richard Pryor Special'?". Splitsider. Retrieved 8 July 2015. ^ "Dictators Rulebook". Radio Times. Immediate Media Company Ltd. Retrieved 2 September 2018. ^ Pandey, Ramesh Nath (9 November 2012) [Kartik 24, 2069]. "Book Review: Culture of the Sepulchre". New Spotlight Magazine. 06 (10). Retrieved 9 August 2014. Kyemba, Henry (1977). A State of Blood: The Inside Story of Idi Amin. New York: Ace Books. ISBN 0-441-78524-4. Wikimedia Commons has media related to Idi Amin. Luck, Adam (13 January 2007). "Mad Ugandan dictator's son reveals all about his 'Big Daddy'". Daily Mail. Retrieved 20 August 2014.